Last month we sent Simpson product reviewer, and more importantly product designer, Ian Harris to Campagnolo’s latest launch in Girona; who better to appreciate every practical and mechanical nuance, production technique and process. It’s the minute details, choice of materials, design values and love invested in EPS: the company’s all new electronic shift system and the latest evolution in their 12 speed ‘Movement’ campaign that needed both assessing and savouring. After the exploits of sharing an early morning flight from Bristol to Girona with an already fully tanked up stag party - everything else felt very civilised - a frame of mind I had long associated with our host Campagnolo. Renowned for their early season Gran Canaria based Press trips, the walled city of Girona, in Spain’s Northeast region in late February presented itself as a complete unknown to all. On my arrival I was welcomed by the rest of the world’s cycling press. A mixed bunch of guys all eager to find out the purpose of their ‘mission’. Movistar, Lotto Soudal and UAE Team Emirates - the Campag equipped Pro teams had already been seen sporting an electronic 12 speed shifter system earlier in the year in Australia at the Tour Down Under. Group consensus hinted that we were there to learn about more than just this. At dinner we were informally introduced to our hosts and as the evening progressed I began to realise the team behind the brand felt less like employers but more members of a family. Notions of solidarity came to the fore almost instantly and reminded me of a story I’d heard about John Surtees’ introduction to another famous Italian marque - MV Augusta. His courtesy to a lady sweeping up in a hall way at the home of Count Augusta (which later turned out to be the Court’s mother) lead to him to a team contract. This respect for family values is shared by Campagnolo. Pride is at the heart of everything they produce, a fact made clearer at next morning’s presentation. 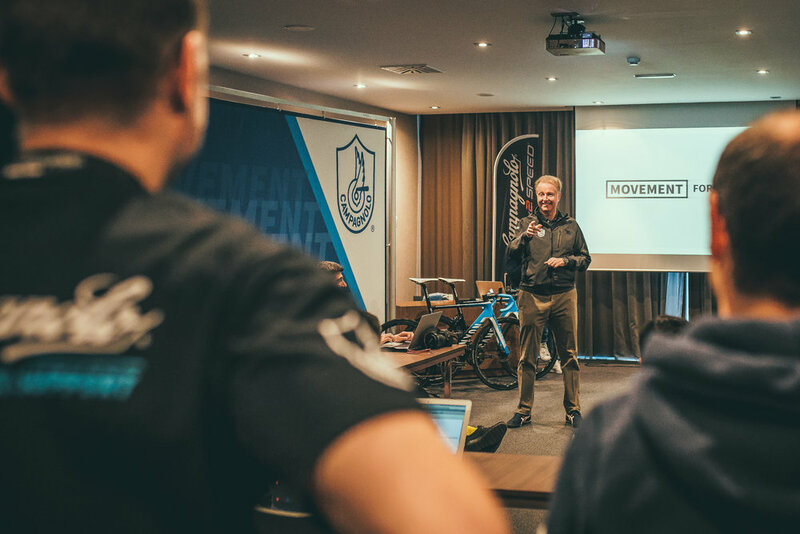 Corporate presentations often struggle to captivate their audiences but a greater understanding of Campagnolo’s approach and philosophy behind the production of their 12 x 2 groupset and the arrival of their electronic shift system, EPS - reinforced my like of this brand. Between global press manager Joshua Riddle and global marketing and communications director Lorenzo Taxis, we were introduced to a long term strategy, a plan to make 12 Speed group sets not only in an electronic format but also in a range of less expensive, more universally affordable versions. Termed as ‘trickle down effect’ - the aim is to make all existing group sets available in 12 Speed. In a sense this announcement was less like a hard nosed business statement but more a company wanting to ‘share the love’, allow all riders the chance to savour the advantages a twelfth gear can bring. Videos associated to the presentation illustrated the finite attention to detail that advanced machining processes allowed in the creation of componentary. Step by step I began to realise this was artisan quality on a mass market scale. To the uninitiated, those not ‘#intheknow’ it was a functional group set but there is an underlying practical aesthetic beauty like a hidden dovetail joint behind every item this company produces. Girona’s weather played its wild card during our stay. Cycling’s ‘be prepared for any eventuality’ mantra rang true with temperatures 10 degrees up on seasonal averages. Being supplied with a winter jacket and bib tights, many riders were forced to session undervests as impromptu short sleeved jerseys. As we headed out away from the city the true joy of the Spanish terrain was overwhelming. Our hosts presented us with a route that truly tested both bike and rider. Initially the only familiar part of my test bike, a Movistar inspired Canyon Aeroad CF SLX were my pedals the rest though soon came together. Campagnolo unlike other gearing manufacturers have always kept their gear changing system consistent - thumb shifts down, fingers shift up. As soon as your hands hold the hoods you instantly know how to change gear - be it manual or electronic. You’re straight away at ease with any groupset this company produces. We were joined on the ride by ex-Italian World Champion and Campagnolo ambassador Alessandro Ballan. Having never met - let alone ridden with a rider of this calibre it was an inspiration to witness the grace and power he possessed. The latter came in useful after I lost momentum handing over my winter jacket to the support vehicle - an ill timed manoeuvre just before a massive climb. The EPS system provided a smooth, accurate, positive, efficient gear change; it delivered exactly what I had hoped for from this long awaited groupset option. It perfectly complimented both the 12 Speed and disc brake combination but I was left feeling that this latest innovation, however good (and it was) remained counter productive to the company’s ethos. For me the feedback gained from manually changing gears still plays a vital role in the enjoyment of riding a bike. It’s about feel, it’s about a oneness, a sense of closeness linked to the ride itself. Any element that in part removes a fragment of the soul of a ride lessens the experience. Electronic shifting detracts from that tactile passion that for me remains embedded in the soul, the DNA of Campagnolo. The joy of interacting with the bike is lessened with electronic shifting. EPS performed exceptionally well throughout the time I rode with it but I‘m unsure if it’s for me. Along with the additional arrival of EPS to the company’s 12 Speed range we were also introduced to two new additional wheel depths, 45 and 60 to join the existing 77 WTO (Wind Tunnel Optimized) Bora range. Campagnolo claim that these wheels represent the ultimate in multi direction wind based riding. These marginal gains make them even better than their existing Bora range. Unfortunately we weren’t presented with the opportunity to put this to the test. However the precision of the 'directly from the mould’ carbon rims on the example presentation set was so seamless and precise it left me no doubt about the quality of these wheels. We hope to sample a set and be able to give a full appraisal in the very near future. Campagnolo have produced an electronic gear shifting system equal to, and in some respects, better than its rivals. The levels of design and engineering incorporated further underline the ever present passion associated with the company. An informal conversation with Lorenzo Taxis revealed that his former employer, Ducati likened his move to Campagnolo as a move from product to jewellery manufacture - such is the respect and affection other companies have for Campagnolo’s design detailing and exacting manufacturing standards. For me this sums up both company and product. Girona is a beautiful City, perfectly positioned for easy access to some of the most amazing cycling roads I’ve ridden to date. If you ever find yourself there, I highly recommend Bike Shop/Workshop/Café - The Service Course as a Simpson ‘go-to’ destination. It inspires and radiates all things cycling.